The new LG G3 is one of the most advanced smartphones ever, but there’s something that can make it even more advanced: a newer processor (don’t get us wrong, the Snapdragon 801 that’s found inside the current G3 is also brand new). Not long ago, we heard that an upgraded LG G3, featuring a Snapdragon 805 chipset, could be released in July. It looks like that may indeed happen, as the alleged Snapdragon 805-based G3 was recently approved by South Korean authorities. 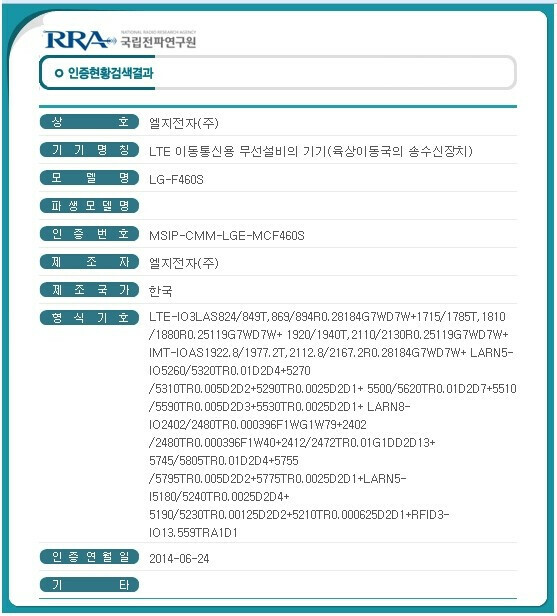 Apparently, the improved LG G3 has three model numbers: LG F460S, LG F460K, and LG F460L, each corresponding to South Korea’s three mobile carriers (SK, KT, and LG U+). Unfortunately, there’s not much info about the new handset. However, the only novelties that it should bring are probably the S805 chipset, and support for LTE-Advanced Cat. 6 (for network speeds of up to 225Mbps). already announced a Galaxy S5 variant with a Snapdragon 805 chipset and LTE-A Cat. 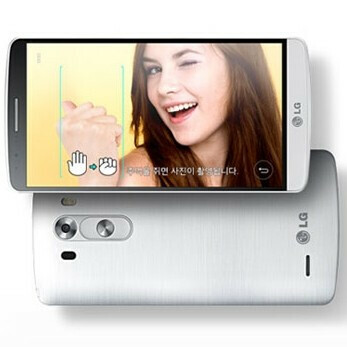 6 in Korea, and it seems that LG will follow soon with its improved G3. Since the Snapdragon 801-based LG G3 isn’t widely available yet (its global rollout will begin on June 27), we’re not expecting the S805 variant to be available outside of Korea anytime soon (or ever). But we’ll see what happens. I thought I was looking at a slider phone at first. 720p - Adreno 320 1080p - Adreno 330 2k - Adreno 420 That's how it should be, glad these H2 QHD phones are coming out with the proper GPUs, here's hoping for a global G3/SD805 release. It's still worse than a 1080p/Adreno 330 set up. 1440p has about 70% more pixels than 1080p, but the Adreno 420 only has 40% more performance over the Adreno 330. It'll still have good frame rates of course, but I don't like going backwards in theoretical performance. Remember it's all dependant on the clock rate of the GPU. The 801 may share the ADRENO 330 with the 800, but the 801 variant has been clocked at a higher rate (578 MHZ) vs the 550/450MHZ clock rates from the two SD800 CPU variants. It would be nice if manufacturers pushed refresh rates higher and Google raised the FPS cap to 90-120. Google did their best to make Android a constant 60 FPS with Jelly Bean, but we have the hardware to go higher now. I'm pretty sure the HTC One M8 has the lowest touch latency on a smartphone. More manufacturers need to follow them. But when the M8 first released it was a big deal, considering most phones have 70-100+. The iPhone 5S and Nexus 5 have 75 ms, the GS5 has 91 ms, and the LG G2 has 110 ms. Sorry could you re post when you start making sense? you should not forget the price difference . LG G3 Snapdragon 801 is a bit cheaper while the Snapdragon 805 will be a bit expensive. actually,it gives people options to choose. either of the two are great and special. Keeping them local to manufacturing locality is going to hurt world image. Just like Samsung is doing. Won't be apparent for some time I reckon, but this will motivate to look elsewhere imo. Losing cred with me. why? like how apple costs 300 dollars cheaper in the us compared to australia? Sorry, what are you saying? I'm saying, biggest sales and hype is abroad, shun the buyer, he'll look elsewhere. Sadly most people wont even know an upgraded model exists, only people who look into it or frequent phone sites, the masses will probably never know it happened. Trust me, everyday performance is very smooth. I've been using the handset for 2 weeks now. No comment . . . I thought Samsung was bad. Damn phone is not even released in the US yet. People here said Samsung releasing GS5 LTE-A 3 months after GS5 was bad. What about LG releasing upgraded hardware 1 month after release? Double standard. True. Right now I am thoroughly annoyed at both companies' strategy. No difference between the two. Huawei honor 6 is coming!! !